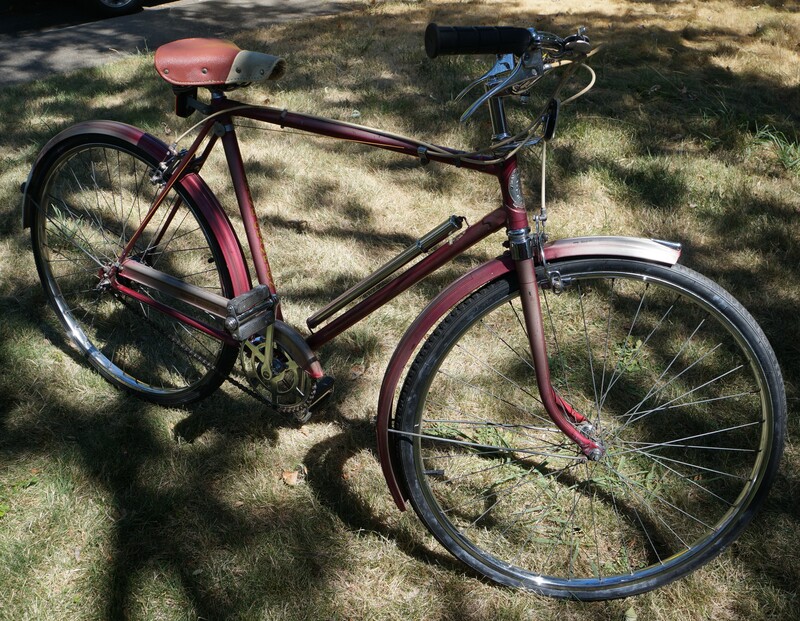 My young neighbor and fellow bike builder Nick refurbished this Grand Champion 3-speed which he got in a trade for labor. Mothers chrome polish job, new tires (included in the trade) and an oil top-up for the hub, which is stamped with the year of manufacture, 1961. Beautiful brass Knight-In-Armor head-badge, flat rubber pad pedals, steel cotter key cranks, original seat and inflation pump, nice side-pull brakes, fashionable black rubber Oury grips. It’s a frequent rider for Nick. Couldn’t find much about the Grand Champion brand on the Web, only two fleeting references, one suggesting it was made by Raleigh. Quite a beauty and still 100% functional and fun. Brown is the patriotic new color for lawns in California. I like the two toned seat. Thanks for uploading the pictures of the bike. Hopefully I can find some more vintage bicycles. Hey i got the women version and was looking all over the web about this bike, but your the only source i could find. I be interested in this bike’s history if you have any more information about it. Nick I can’t find much on the web about the English Grand Champion bike, maybe because the name’s so generic. It looks a lot like the Raleigh bikes of that era though. Here’s the late fabulous bike guru Sheldon Brown’s web page on servicing them. They are built so well they’ll be around for a while. I’ll have to walk over and check it out. If the condition is like the male bike it’ll be a beauty.